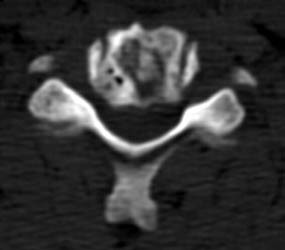 61 y.o male, s/p c4-5 discectomy and interbody fusion for myelopathy. 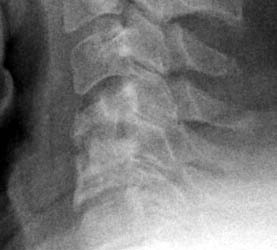 Initial post-operative films show bone graft intact, with mildly prominent pervertebral soft tissues, as expected in the immediate post-operative period. 8 months later, the follow-up films demonstrate lucency at the graft site worrisome for resorption. 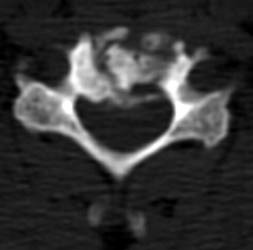 Figure _. Axial CT examination, without contrast. 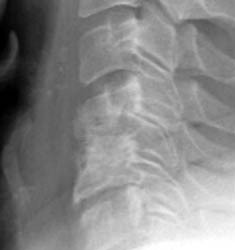 The axial images, and the sagittal reconstructions (not shown) show some central lucency in the region of graft placement, suggesting partial resorption of the graft material.